Now I don’t mean to say that Recker is retro just for the sake of it because that doesn’t always appeal to me and I’m certain it doesn’t always appeal to other people as well. While an old school influence is always appreciated, when showing it off, some bands come off as more calculated than others while Rich & Co. bring heart & passion to the music. This even carries over to the production side of things, you’d be surprised to learn this was a self-released effort. There are a number of great tracks here. “One The Run” and “Olympus” are lean and mean, “Fool” is a fantastic ballad that stays strong and metal while “1,000 Years” is just a beast and exactly the type of song I want to hear from a band like this and “I Will Be There” is a dark, pounding track that brings the album to an appropriate close. Overall, this is a great album old school album to throw in the player and listen to. 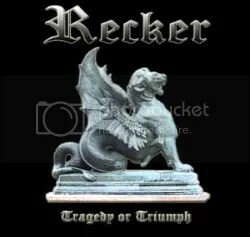 Recker has heart, Recker has riffs, Recker rocks! Definitely recommended.